The screenshot above was taken from a Sunday, March 15th, REUTERS article. Please read the last (3rd) paragraph under Putin’s photo. Whenever the Mainstream Media does decide to post a more accurate account, Reuters is often used to initiate the truth-telling, which is then disseminated more broadly as they did using the Yahoo internet news platform shown here. Where Lake Valdai is mentioned as the current whereabouts of President Putin, it is much more likely that he is at his spiritual retreat site a couple hundred miles north on Lake Ladoga. The following article explains further. 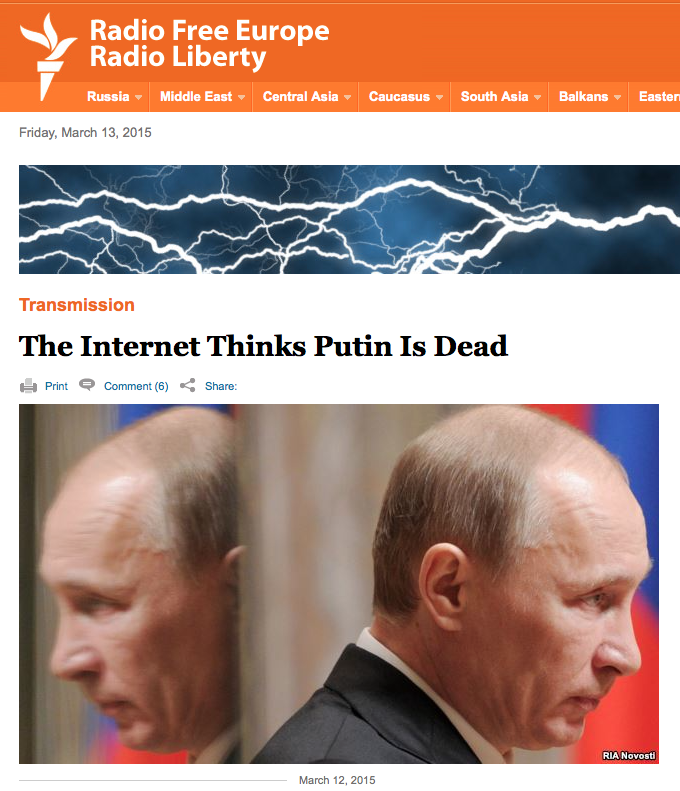 No, Putin is not dead. He’s not ill; he is the victim of yet another CIA-fabricated hoax. 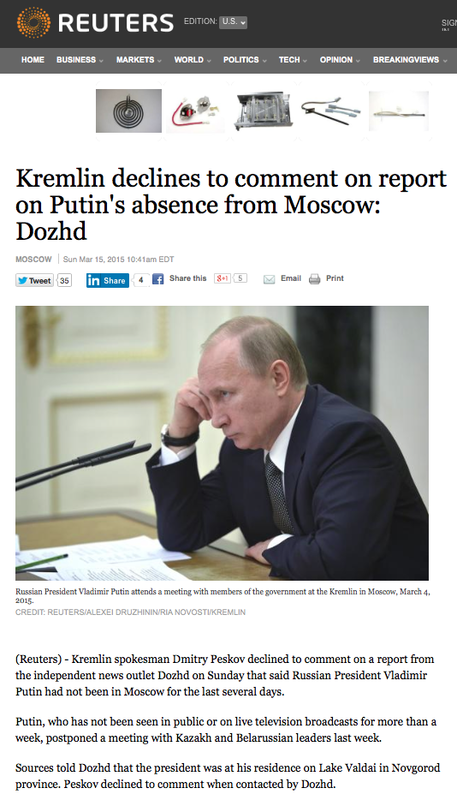 Is Vladimir Putin’s public absence related to the Russian Orthodox Lenten schedule? The West takes advantage of Putin’s religious downtime by circulating a false story regarding his death, when they know he’s in his annual Lenten period of monastic silence. This exposé is based on the premise that the premier intelligence agencies and secret services of the Judeo-Anglo-American Axis control — COMPLETELY — every major organ of the Western powers’ Mainstream Media (MSM). In other words the CIA, MI6 and MOSSAD exert final editorial license over all the major newspapers, television news channels, radio stations, internet news platforms, book publishing houses, motion picture industry, etc. throughout the world with the exception of those obvious few. Whether the MSM news outlets are ultra-conservative and hard right or ultra-liberal and far left, they still operate under the strict direction of The Company (CIA, MI6 & MOSSAD). The leadership of the Anglo-American Axis (AAA), led by a highly secular government in the USA, knows exactly where President Vladimir Putin is, just as the Russians always know where President Barack Obama is. Given the highly advanced state of the art of information technology, as well as the extremely efficient workings of both Intelligence Agencies and Secret Services, the whereabouts of a major head of state has become fairly easy to determine… with absolute certainty. This now normal state of affairs is exactly why the AAA is using the Mainstream Media (MSM) to disseminate a patently false and malicious story about Putin’s death. 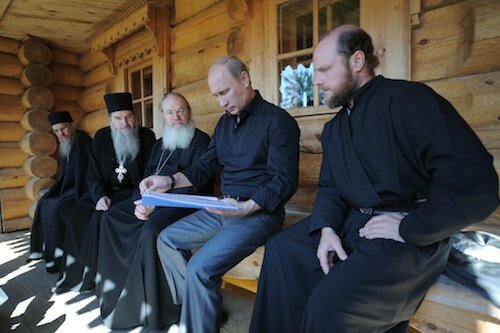 Since Putin is known to be a regular religious recluse, the West can confidently make mischief whenever he takes his extremely valuable monastic downtime. On an island far from the mainland, the Valaam monastery is one of the Russian Orthodox Church’s holiest and most isolated sites. The AAA knows that Putin is facing the biggest decisions of the year. They are also well aware of his yearly religious practices in which he seeks out the highest spiritual guidance in order to make the best decisions, both personal and governmental. What better way to disrupt his necessary annual retreat than to spread fabricated rumors — worldwide — that he has passed away. Of course, the CIA uses their main tool Facebook to viralize the MSM psyop. Facebook (FB) is now well known to squelch so many truth-tellers in the process of ‘managing’ (read controlling) their massive social media platform. They are notorious for shutting down truth-disseminating initiatives with the flip of a Facebook switch. Who hasn’t heard of an instance where someone or some organization was rolled by FB? Rolled into FB page termination, that is! Let’s face it, Vladimir Putin is now the most watched person in the world, and you-know-who does not like that? Not one bit! Putin is watched very closely not only in the West, but throughout the East as well. However, it is clear that the West has him under the most powerful, multi-media microscope in the world — 24/7. It goes without saying that the CIA, MI6 and MOSSAD are working in very close coordination on this black operation, just as they usually do concerning all things PUTIN. Here’s the Israeli Intelligence Services’ (MOSSAD) ‘secret’ website — DEBKA.com — for disseminating misinformation, disinformation and false information whenever the psyop requires such. According to AllNewsPipleline.com (ANP) the following drama was directed by Reuters.com, predictably as ever. What follows are the screenshots which the folks at ANP thankfully captured as proof of how deep this thing really goes. REUTERS, the oldest and largest of all the MSM outlets founded by and with the Rothschild family fortune, is the granddaddy of all the original Fleet Street publications. It functions as the quintessential Mainstream Media outlet which publishes most of the English-generated propaganda throughout the world. 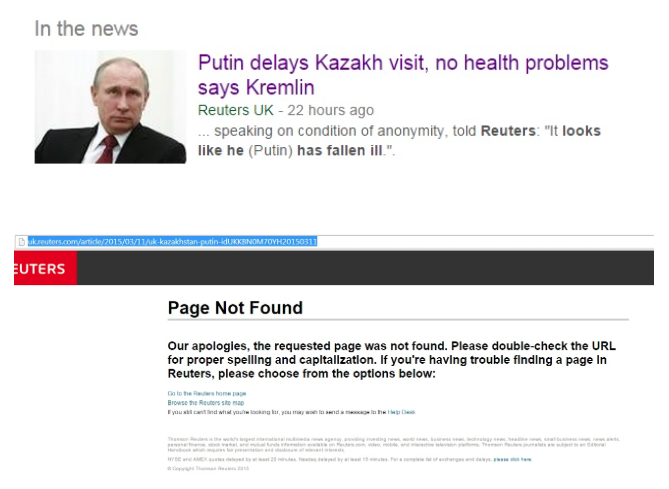 Just like the BBC, REUTERS also seeds the internet with untold numbers of anti-Russian news reports and false stories. What is particularly interesting is that REUTERS’ Canadian affiliate decided to leave a similar setup piece on the internet as seen in the link below. AllNewsPipeline deserves much of the credit for doing all the internet investigation around this ongoing CIA PSYOP. Having researched many of the various elements, it was then quite easy for The Millennium Report to connect the many telling dots. Here is one more British-controlled MSM outlet (www.express.co.uk) which is routinely used to seed the internet with false stories and fraudulent reporting. Every single word of the article below is both deliberate and calculated. Truly, the tabloids that were once located on Fleet Street in the City of London were masters of such yellow journalism. The agents of the Judeo-Anglo-American Axis will do just about anything to knock Putin off balance. They are well aware of his deep spiritual leanings. They are especially cognizant of how necessary it is to deprive Putin of his extremely important periods of fasting, prayer and meditation. The Russian Orthodox Lenten Season is a particularly significant time for intensified spiritual practices. The fasting schedule alone encourages more opportunities for a heightened spiritual awareness which then positively affects one’s capability to meet life’s mundane challenges much more effectively. However, an unbroken period of deep contemplation and other spiritual practices are necessary for a successful outcome. What easier way to distract President Putin from his annual monastic ritual than to steal his attention with a “PUTIN is DEAD” internet campaign. Particularly when they know he is so attentive to the needs of the Russian people, is this plot cynical and contemptuous. You know the CIA is getting quite desperate when they become so transparent in their ill-doings. 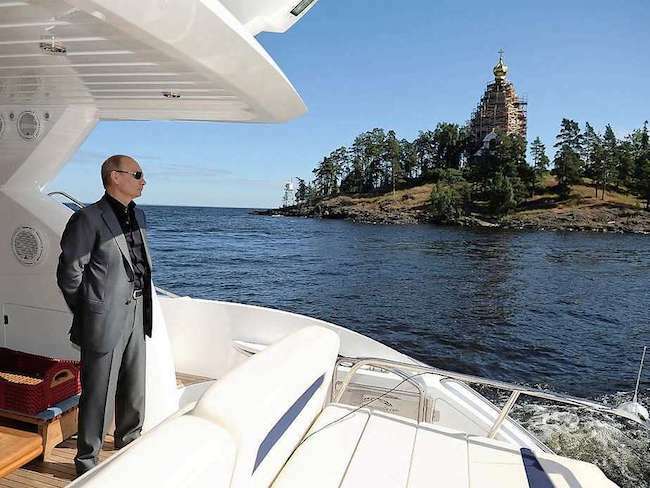 Vladimir Putin makes regular pilgrimages to the Valaam Monastery not too far from the Finnish border. In fact he took a “highly protected and secretive 4-day visit to the Valaam Monastery” in April of 2014 during the height of tensions shortly after the U.S.-coordinated coup d’état in Kiev. 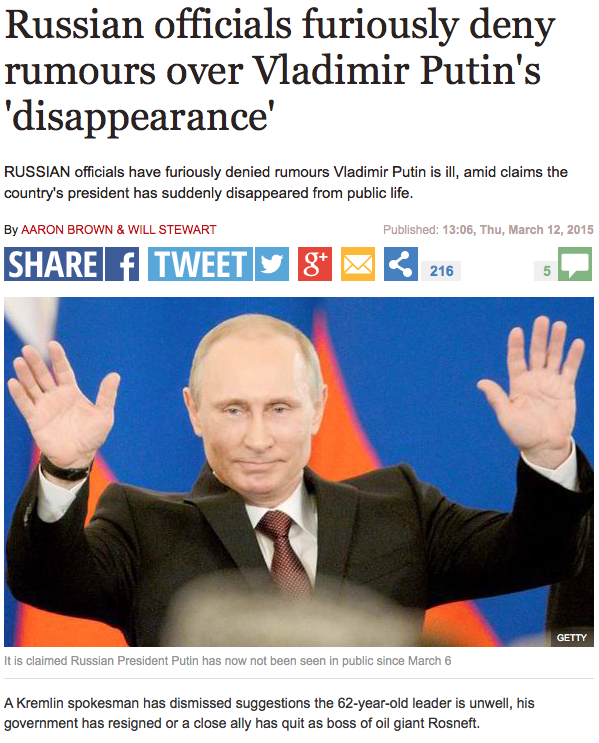 This was another time when Putin was reported as AWOL by the Western MSM. The leaders who populate the top tiers of the Anglo-American Axis are notorious for their lack of religious affiliation or spiritual orientation. Their actions, words and decisions reflect this extremely unfortunate state of affairs. Because of this, the ruling cabal of the West does not understand Vladimir Putin. His actions and inactions are quite perplexing and often inscrutable. He will remain an enigma to them until their collective posture undergoes a radical transformation.